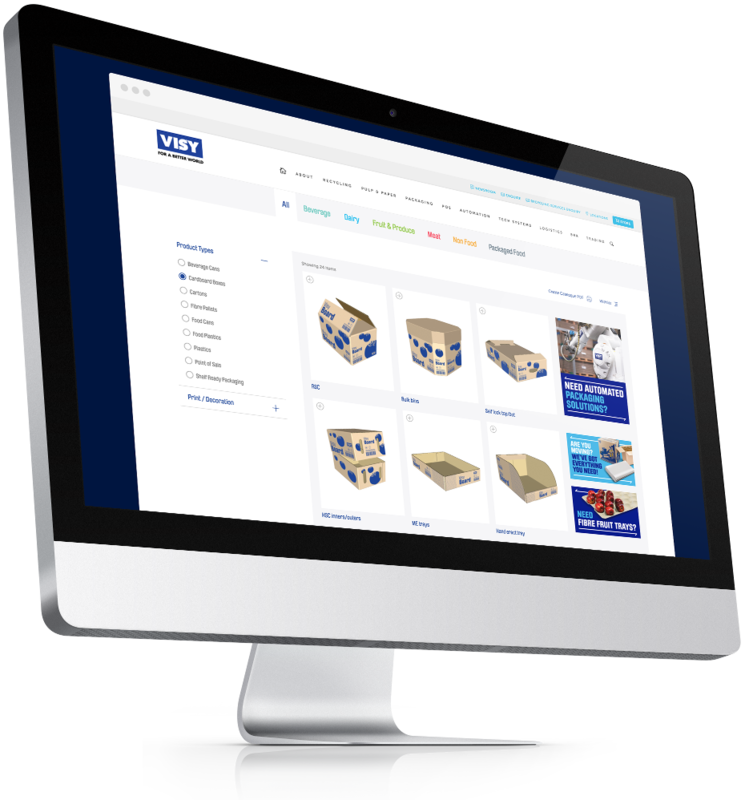 We designed and developed an online product catalogue for Visy. The software was developed on a custom content management system (CMS) to feed content through to a Squarespace website. Fully-customiseable and managed by Visy, the software can be configured to manage how Visy clients from across the globe interact with their products online. This project has revolutionised Visy's ability to present a complete offering of its products across its different product verticals. Visy products a range of products - from Beverage Cans to Cardboard Boxes; Food Plastics to Shelf Ready Packaging. The key was to present these products along-side one another, while allowing for different specifications/search parameters to be present. Similarly, the marketing team wanted to present products both by Product Type as well as the Industries that the product relates to. And all of this was to be managed/editable via the Content Management System (CMS). DCODE GROUP developed a custom CMS to allow Visy to manage Products online. Each product caters for specifications specific to that product type - and filters adjust on the search to ensure that you can find the appropriate products online. Every product is linked to an automated Specification Sheet generated in PDF on-the-fly. And reporting and enquiry management helps to review the performance of the service and send the enquiry to the correct division. As part of the process, we also rendered the product images for Visy - providing design and implementation of the labelling as well. As a result of implementing this solution, Visy has been able to market and engage with both clients and sales representatives using a consistent presentation of its products across all division. 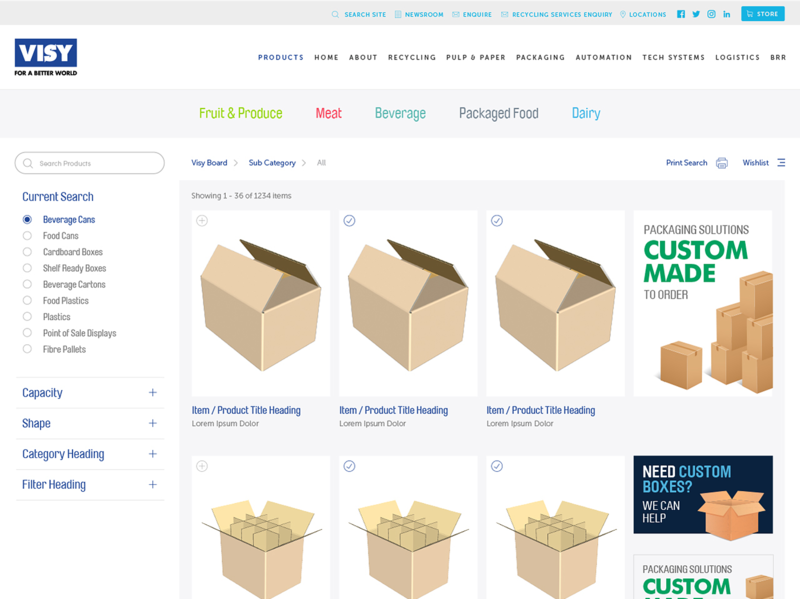 Product specifications and options are clearly indicated - helping customers browse on their own, but also empowering sales representatives to package product spec sheets for customer presentations and use the cataglogue as a presentation tool. We spent alot of time listening to Visy about their products and offerings and looked to develop a solution that matched their requirements. As this was the first time Visy had catalogued their entire product offerings, we needed to be flexible as much of the process was exploratory. In the end, we were able to deliver a flexible and customiseable platform that integrared seamlessly with their current website.